For New Year Japan has depending on job and company a whole week of holidays. My friend Hung Lun and I decided to spend this week exploring 四国 (Shikoku), the island below Japan's main island 本州 (Honshuu) big enough to contain 4 prefectures. In the weeks before that many Japanese people would give us advice about 四国, like which special food it offers (almost every place in Japan offers some unique food, which is usually the first things coming to the mind of Japanese people, when hearing the name of a place), what places to visit and what else they knew about it. Firstly we were told of a special winter holiday train ticket called 青春１８切符 (seishun18kippu: seishun = spring of youth, 18, kippu = ticket), which allows you to go with all the local JR (Japanese Railways, the biggest Japanese Railways company) trains, for five days for one person, or two days for two persons and one day for one person, or one day for three persons and one day for two persons and so on for 11500 Yen, roughly 75 Euro. We learned that there are two big bridges leading to 四国. One for cars and one for trains. The one for cars was closer to us (at 神戸 Kobe), while the other was more far away at 岡山 Okayama. We were told that along the 神戸 bridge leading to 鳴門 Naruto, you can see a lot of water vortices in the ocean. That is btw. were the name of the Manga/Anime character Naruto originates from. Japanese people traditionally go to Shinto shrines (神社) and pray for a good new year. In 四国 there was a very special 神社 on the top of a mountain, called 金比羅さん (Konpirasan) in the city of 琴平 (Kotohira) which annually attracts a lot of visitors from other towns and prefectures as well as the locals. But we were also told about the 四国　遍路 (Shikoku Pilgrimage), a Buddhist pilgrimage through the whole of Shikoku passing 88 temples, beautiful landscapes and mountains and as few big cities as possible. To finish all 88 temples by foot only about 2 months are necessary. We decided to explore Shikoku in this way after 大晦日 (Oomisoka ~ Silvester) on top of 金比羅さん and try to get from 松山 (Matsuyama), capital of 愛媛県 (Ehime prefecture) to 高知市 (Kouchi), capital of the prefecture having the same name (高知県) by foot passing from temple to temple. A pilgrimage needs to be prepared for, so the days before we though of things we might use on the journey, while trying to bring as less weight as possible, since we would have to carry it for days. A nice contradiction to start with. For a start we were alas! not able to find sleeping bags or a tent in time, so we couldn't bring any of these two. Instead we did some 厚木 (Atsugi, the town were we live) exploration and payed a visit to the workman's store, buying good working jeans and special temperature containing socks. Then we continued to a Baumarkt (D.I.Y. market) and bought a compass and a really good flashlight, going low on batteries while making a lot of far reaching light. Finally we bought a first book about the Henro (遍路) to know where we should start and read some information in the internet. After that we cleaned up the Common Room of our Youth Heim, were people leaving the same would leave their luggage for ages, without anyone ever bothering to look through it. Apart from some cool stuff we kept in out rooms, for the journey we made a first aid kit (a collection of still good and closed ointments, bandages and the like), procured two big blue tarpaulins and found a lot of equipment to make fire. As much as we would have loved fire later on, we didn't bring this fire equipment with us, since the making of fire, especially in mountain woods is of course strictly forbidden. From our own stuff we included extra pairs of socks and underwear, a book to read, a camera, tooth brush and soap, a rope (thanks Sam Gamdschie), some string and needles, money and rain as well as winter gear. Finally we bought some fruits and power muesli bars to take along the journey. Since local trains are really slow (stopping at every station), we tried to get up as early as possible and eventually headed for the station at around 7:30 Sunday 30th of December 2007. Atsugi (厚木) has no JR station, so we first headed to Machida (町田) to buy the Kippu. From their we used the Kippu to Shin-Yokohama (新横浜), were our train map print out guided us to. There we had to notice that it is not possible to get local train only train schedule information from the internet and our map was completely useless. So at each station we had to ask for the next station to reach Kobe, having the goal to pass the bridge by bus or use a fairy and see water vortices along the way. The journey took longer as we could ever have expected. We had to change trains for over 10 times and spend the whole day inside looking, reading, talking and sleeping. When we eventually reached Kobe it was already completely dark outside. So we forgot about the ferry and looked for a bus, which we found, but which made us wait two hours in Kobe. Ok! Enough time to explore the city a little bit. We browsed through the streets looking for some dinner when Hung Lun reminded me, that it was one of his plans in Japan to try 神戸肉 (Kobe meat), which is famous even across Japanese borders. The cows killed for the meat live the life of princesses being massaged every other day getting only the best of food. The price for the steaks are accordingly high. We went into one restaurant, certified to serve 神戸肉 and took two seats. Luckily for me, they had some really good grilled vegetables too, so that there was no reason for me to starve :). They would prepare the meat in front of you on your table to your desires. The price Hung Lun had to pay was around 7000 Yen (50 Euro) for a small steak, but it was worth it, he said. It really tastes extraordinarily good and he did not regret spending so much money on it. After some more browsing through the city and eating some Belgian waffles as desert, we headed back to the bus and would let it take us over the ocean to 鳴門. Since it was already eight o'clock, we saw nothing but the lights of small islands in between. When we arrived in 鳴門, we had to realize that the bus stop was on a highway. Since we had no idea how to come to Naruto from there in the middle of the night, we decided to stay in the bus until the final stop at 徳島駅 (Tokushima Station). 徳島 Tokushima is the capital of the Shikoku prefecture with the same name. We reached the station after 11 pm and were anxious whether we would find a place to sleep. There was a big luxurious hotel next to the station and Hung Lun wanted to enter ask how much for a room to sleep in. I found that cute and went inside with him, but let him ask them for the room. The said 20.000 Yen for one person one night (~140 Euro). He replied that is a bit much, and we left again ^=^. After looking around a bit and asking some people (that is always the best you can do, even if your Japanese isn't perfect or you only know, or can look up some keywords, like hotel and cheap) we found another hotel for rooms under 4000 Yen and accepted it. We did neither reach 琴平 Kotohira, nor the first 遍路 Henro temple, but at least we reached Shikoku and called it a day. Waking up the next day we left the hotel and looked around 徳島 Tokushima a little bit more. Hung Lun found this wonderful little sweets shop, lead by an old laday, which still made and sold sweets herself :). After a bit of gossiping we learned that she did the 遍路 herself for 4 times and is so happy that we would also do it. Thus we received our first お接待 (Osettai, more about that later), two bags of みかん mandarines. Furthermore she told us that there would be a very cheap bus leading from 徳島駅 Tokushima Station directly to the first of the 88 temples. As a thank we bought our sweet breakfast at her shop in the form of cakes and 餅 (Japanese rice dough) and looked for the bus. I cannot emphasize you enough to gossip with people as much as possible, when being on a trip in Japan, you will learn fascinating things, get special items, learn about short cuts and uncover some cool side plots. Yes it is exactly like in an RPG! ....probably the best hat ever, it shields you against all kinds of weather! In winter it keeps your head warm and shields your body from snow and hail, in summer it shields you from the sun's rays and keeps your body under a shadow and in autumn it shields you against strong winds. Walking through woods it also shields your face from all kinds of things hanging down from trees as well as things falling down. I really loved my hat and will keep it dearly. ....having hand written 漢字 (Kanji, chinese characters) on the back it both protects you with the writers hopes and indicates to other people, that you are a 遍路 Henro Pilgrim. It can easily be worn over other garments. ....completing the white appearance of a henro. Again you can wear it over your normal trousers. ....a book with detailed maps that will lead you to the temples. You cannot go without, if you want to cross mountains and other uninhabited areas by foot. It also tells you were you can find sleeping facilities near the 88 temples. A second books extends this one with information about temples and areas. Both are in Japanese, so if you can't read Japanese, get at least the map book. Every name contains Furigana. ....which had become our third leg. It is also incredibly useful and make walking for long hours a lot easier. Also especially in winter mountain paths it can be a great aid. ....they serve at least three great purposes. 1. You always know where your partner is, since you can hear his bells. Once you don't hear them anymore, you know he stopped or something happened and can turn around. 2. In the woods, mountains or areas with sparse population it is more easy for people to find you. 3. When walking to small mountain villages or at night, people get sometimes afraid hearing walking feet. If this sound is however accompanied by bells, everyone know that Henro are passing by and might even decide to go out and greet you and maybe even give you a little o-settai. 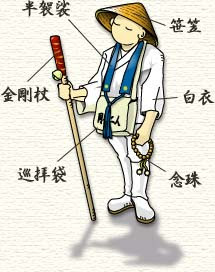 Other things you can include, which we didn't are 念珠 Nenju (a Buddhist rosary) and a 袈裟 (Buddhist stole). Some words to religion. You do not have to be a Buddhist to go on this pilgrimage. The pilgrimage is meant to be a personal journey which can have any goal you set yourself. It gives you a lot of time to think and will teach you a lot of individual experiences for your whole life. You should however pay respect to both the temples as well as the people on your way. This means always be friendly a Henro is not angry, be ready to endure hardships both from the journey as well as from people, who might not like the thought of a foreigner going on a Henro (although this case is rare) and other things. For paying respect to the temples, that means following a certain number of rituals when entering a temple. 7. and 8. are optional. Some temples might have some exhibitions (usually free for Henro) or other interesting things, feel free to look around. Some temples might also offer food or shelter for the night, you can ask for it at the counter where you can get the signatures. Finally being a 遍路 it of course not only about receiving, but also about giving. Since you are not carrying very much, you might think it hard, but we always could think of something. At the latest you can relate interesting stories about your home country :). For me being a Henro was a really deep philosophical religious experience. Although we only traveled for one week the pendulum of life would often completely turn from one extreme to the other within days. I will relate more about this in the storyline of our adventures. After getting the garments together we visited the first 3 temples, which lay on the road to the next JR station. From there we took the train to 琴平 Kotohira, to spend Silvester on the top of the mountain/shrine. Passing the prefecture border, we had two make a two hour stop at 香川県 Kagawa prefecture's capital 高松 Takamatsu. We looked a bit around the areal around the station and went to the port. It was incredibly windy this day and the wind was so strong that you had a really strong resistance trying to move against it. After the two hour break, we arrived in 琴平 Kotohira in the afternoon. 金比羅さん Konpirasan was easy to find since the town is really small. In the afternoon we saw many stands preparing for the night, but apart from that everything was quite desolate, the reason being that in Japan you celebrate 大晦日 Silvester with your family at home rather than with friends partying. Between 5 and 6 pm we realized that we would have to wait until midnight on the cold mountain and then even 6/7 more hours to see the first sunrise of the new year. So we decided to get back to the station and wait until 11 pm to get to the shrine. You can make it from the bottom to the top in around one hour. In the station we bought some お握り (Onigiri) for dinner and played 3 games of 囲碁 (Go Japanese/Chinese Chess). It was the first time I played and I lost the first two games, but was able to win my first game at the third attempt. When we were reclimbing the 2000 stairs to the shrine, this time it was packed with people. Maybe at around 1/3 of the way up, there was a big platform with all kind of activities going on. We were given some kind of warm Japanese milk rice to warm us up (for free! :), we could write a personal message to big white boards inviting the year 2008 and see a lot of other cool things related to the new year. It appears In Japan traditionally having had both the Chinese calender as well as the West one, nowadays they celebrate a combined form by celebrating after the West calender at the 31th of December, but at the same time using the Chinese Zodiac animals to depict the year. Therefore starting from the 1st January 2008 for Japan the year of the mouse/rat had come, while for China it will be still the year of the swine/boar until February. Climbing further to the main shrine we soon got stuck in a peoples traffic jam. It seems the storm to praying at the main shrine was so huge that the police had to regulate the flow of people only letting 100-200 to the shrine every 20 min. Therefore we alas missed the visual midnight performance, while we were at least able to perceive it acoustically. When we reached the main shrine around 1 am, the flow of people had far from exceeded. We looked around the main shrine's platform, buying good luck charms and sitting down in a place dedicated to a strange Japanese submarine, which hang from the ceiling. Why someone would bring a submarine to the top of mountain is beyond my grasp, yet I find it a highly romantic thing to do. And then we continued to the 奥社 the far off shrine at the very top of the mountain. We maybe reached it around 3 pm making a stop of one hour in a resting place on the way, which we quickly called home. 3 pm meant 3-4 more hours until the sunrise and we were exhausted sleepy and tired. For a start we headed back to our home and tried to sleep a little. But it was too cold to sleep, so we soon gave up on it. We played another game of Go (I lost) and climbed to the top and back for maybe 4 times to heat up our bodies. We also bought some 懐炉 (Kairo pocket heater) at the station, which in contrast to its short lived European counterpart is able to maintain a certain heat for 12 hours. We were really glad to have it and used it to warm up our frozen hands and feet. Eventually at around 6 am, having still no sign of the sunrise we headed back to the main platform and sat down under the submarine. When we were ready to go back, the horizon suddenly started to brighten up and I convinced Hung Lun in heading back to the top of the mountain one more time. When we reached it maybe 30 min later, the sun truly slowly began to raise, yet it was completely hidden behind a thick layer of clouds, so that all we could see was the landscape getting brighter. A bit disappointed we climbed all the stairs down again, said farewell to our home and got back to the station. While we were waiting for the sunrise in our home we had agreed to give up on visiting temples in 香川県 (Kagawa Prefecture), the prefecture where 琴平 Kotohira is located in and head directly for 松山 Matsuyama, the capital of 愛媛県 the Ehime prefecture. Using the Kippu and thus using only local trains we were able to sleep on the long train rides and enjoy the wonderful landscape in between. and many shrine shops sold お守り Omamori (little things for protection) and 御神籤 Omikuji future telling sheets. Arriving in 松山駅 Matsuyama Station we asked at the information for a place to sleep. After a while we were thus able to find a Youth Hostel room for 2000 Yen and really happy to be able to spend the night in a warm bed. After that we headed by food to the reason of coming to Ehime's capital. It hosts Japanese oldest 温泉 Onsen Hot Spa, the 道後温泉 Dougo Onsen. Once build for Japanese Tennos it is now accessible for the public. On the way we crossed Matsuyama's public park and paid a visit to the lower part of 松山城Matsuyama Castle (the main part is on top of a mountain). The entrance is really cheap and you can see a really nice garden as well as get a nice view over the city. We also got two free oranges. After that we headed for the 温泉 Onsen Hot Spa. There are a lot of different options to enter. If you only want to enter the Onsen, you can get in as cheap as 400 Yen. We decided to use the topmost but one ticket for 1500 Yen and for a feudal landlord service. Thus firstly we were given our own 畳 (tatami) room with wardrobe and a bowl with mikan (mandarines). We got undressed, and got into Yukata (summer kimono, similar to a thin linen bathrobe). Then we were lead to the special landlord hot spa, but told that if we want we could also use the normal one. We decided to use both with a short break in our room in between. Being Japanese oldest hot spring, the water from the hot spring (70 degrees by the way, it is mixed with normal water to be cooled down to 42 degreed for the bathing), the water from the spring in meanwhile used by many hotels in the area and even the Youth Hostel, so the Tenno family as well as reminders of feudal landlords no longer need to go to the Royal Onsen, but can enjoy the same healthy water at the hotels. You should not spend too much time in a 温泉 Onsen, since it can be dangerous to your circular system. But around 5 min with breaks in between are really healthy for the body and very relaxing. After that we recovered in our landlord room and were served green tea and Japanese 餅 mochi sweets (団子). After that we had a guide through the exhibition room of the onsen and were shown the Tenno's Onsen. After that we headed for the Youth Hostel, which had a special new year dinner, but we were too tired and sleepy and slept right away, Hung Lun even before he could reach his bed (in a comfy chair). After awaking at the Youth Hostel we got down to the Onsen again since Hung Lun wanted to buy a Onsen towel as a souvenir, I also got one. The we had a short breakfast at one of the Konbinis and studied our map book we found that temple 51 石手寺　Ishiteji is very close to the Youth Hostel. So we headed back to the hostel and walked some nice path over a hill and though a big forest until we reached the temple. Just before we left the forest a nice Japanese lady related us a story over this special temple. It is the most visited on, since it is close to 松山 Matsuyama, maybe Shikoku's biggest city and therefore has a lot to offer, like a special exhibition and a lot of temple shops. But it also contains a special 88 temple tour for people unable to complete the real 88 temples. We decided to go for it after visiting 石手寺. The temple was crowded with people, probably because of the new year. We visited the exhibition and looked around the shops, I got a signature and then we went for the 88 small temples in the nearby hills. Each temple contains a small statue of a Buddha and small box for money donations/offerings and a pile for 納札 Nousatsu. The wonderful path leads through the forests on the hill all the way up to the top and down again. On the top of the hill you can find a large Buddha statue, which can be seen from far away. Then after 44 temples you miraculously reach temple 51 again. After following some signs you can find yet another path at another hill leading to the 44 other temples. This path also miraculously leads back to temple 51. At the first 30 or so temples we would burn some 線香 incense, but afterwards Hung Lun remembered a story from China were people cause large mountain forest fires each year by burning incense in the mountains for their parted relatives. So we ended this practice and left a 納札 instead. After completing the small 88 temples we reached temple 51 again and did some more planning. 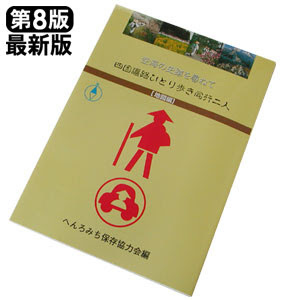 Our original plan included to visit 高知県 the Kouchi prefecture, the last of the prefectures we had not been to. So for now we decided to follow the temples in reverse order 逆路, since this would lead us more and more close to the 高知県 border. Our map book fruther indicated three places to sleep nearby one 旅館 (Ryokan, trad. Japanese sleeping facility on the roads) and two hotels. The hotels were closed because of 正月, the one week new year holidays, and we could not find the 旅館 after asking a lot of people, we eventually asked two old women, who knew that the 旅館 was abandoned a couple of years ago. After relating them our need to spend the night, they told us of a special お風呂 Ofuro (Japanese public bath, similar to Onsen but with heated water), which has open the whole night, so that we could at least spend the night at a warm place and maybe find some sleep sitting in the waiting room. The お風呂 was quite extraordinary. It included a large recreation/waiting areas with two TV sets both for children and adults, massage chairs, a lot of vending machines, some place where you could buy hot food and places with tables to write as well as soft cushion block seats for the TVs. The spa itself contains several pools with water in different temperature, but all between 35 and 45 degrees. There is a sauna and a cold pool nearby. Then there is the special moonlight area, where you can bath traditionally under the sky and an area with thrones where both your feet and your arms and hands will be under water. Some whirlpools and some possibilities to lie down while your feet will be warmed in a hot stream of water extend the normal pool you'd expect so far that it is almost like a water fun park. After regenerating in the pools we tried the massage chairs, watched some TV and read some in our books. Then we tried to sleep, which was quite difficult, since the recreation areas was so noisy and the flow of people never exceeded not even during the late night. But in the end we got at least some sleep and could enjoy another hot bath in the morning, as well as another 15 minutes in the massage chair, which relaxed my shoulders to such an extent that they did not hurt anymore for carrying my backpack for at least a day. But after that at around 8 o'clock we left the お風呂 and started to head for temple 48.
where are we going mika? We have to cross the bridge! You are reading the maps all wrong! We start from the お風呂 make the way back to temple 49, refilled our supplies and had breakfast at the Konbini, which luckily even had fresh fruits. Being not allowed to eat inside a Konbini we ate behind some containers nearby using the blue tarpaulin to sit on. An old man walking by spotted us between the containers and asked us: Ahh ye're doing a Henro, ne? Then he gave each of us 1.000 Yen. I would not accept it, but then he said, it would be an O-settai and we had to accept it. So we did. Then we started the 3 km walk to the next temple 48 西林寺 Sairinji, our longest inter temple distance so far. We passed a large gold area which even had car bridges over the territory, so important is golf to Japanese people. The next temple after 西林寺 was even farer away with a 5 km walk in between. The paths lead us more and more into countryside. The Konbini at 49 was the last Konbini we would see for a long time and even drink vending machines got a bit sparse. The villages got smaller and smaller and the buildings looked older and older. We reached number 47 八坂寺 Yasakaji around noon and though far off, the temple was quite well visited. We met a lot of other Henro and when leaving the temple an old woman asked us, whether we were here on foot. We replied; hai. And she gave us another 1.000 Yen as o-settai. Temple 46 浄瑠璃寺 Joururiji was almost around the corner and reached it around 14:00 pm. The lady making the calligraphy signatures chatted a bit with me, worried about our plan to reach temple 44 today and gave me one mikan as O-Settai. After another short break and the explained temple routine we decided to try reaching 45 before the end of the day. However our map indicated it to be 16-30 km away. We don't know why the gap between the numbers was that large but wanted to make it. So we kept on walking for a long time and now got into real countryside. The villages could be easily be completely seen from every point and eventually you could not call the villages anymore, but some sparse settlements of farmers. The road steadily began to rise and rise and we were constantly moving upwards towards the mountains. Without noticing we were suddenly encircles by mountains. Finally finding some persons outside, we were able to ask for the way to the temple 44 (大宝寺　Daihouji), which was in fact closer than 45 and noticed that we were on a wrong road. However using a fast climbing road we could get back to the track indicated by the map. Every road of course is fine, but the map lines are the fastest connections. As the day grew we came no closer to our goal and had to accept not reaching it before dawn, being stuck in the middle of nowhere. But suddenly we came across a little settlement high up in the mountains and found a little house offering 布団 (Futon) for pilgrims. Alas it was closed, but we sat down to catch some breath anyway. When out of nowhere a man appeared asking us, whether we have no place to sleep for the night? We confirmed his assumption and he told us of a mystical hat on top of the mountain, where we could sleep. We first thought it would be his, but he turned out to be someone living on the walk (homeless). So we could make no rhyme out of this mystical place on top of a mountain, but gladly accepted his offer to guide us there. However, he said, it would be quite a exhausting fast mountain climb, if we want to reach it before the night crawls in. Reaching it before it gets dark however should be our top priority, since climbing the mountain in icy winter with all the snow and ice is hard and dangerous enough, being robbed of sunlight makes it almost suicidal. So without further delay we packed up and followed our mountain guide through forest paths steadily upwards the mountain. He would agree to short breaks of no more than 5 minutes, but then push us further through the cold. The cold was not much of a problem then, since our bodies were fired up by the exhausting climb, however we had to watch our step, because of ice and snow. We didn't talk much on the journey, since it was too exhausting, so the mystery on this hut remained. When the sun already began to set and the light of the day slowly began to fade away, he pushed on a last time and there we were. Top of the mountain with our mountain expert pointing at a huge wooden building next to a road. We could enter the building although, nobody seemed to be in there. He would ask us to bring some wood inside, prepared outside the hut. In the middle of the hut was a large black oven, where he really skillfully managed to get a fire burning with the snow covered wood from outside. Then we slowly settled down, cached some breath and let him, who would introduce himself as Yamaguchi, 48 (looking like 30), having 3 children with a divorced wife, which he hasn't seen for 8 years and a brother he hasn't seen since his mothers funeral 15 years ago, because his brother as himself is homeless, relate the story of this hut. It was build and payed for by a Buddhist monk after several pilgrim had frozen to death trying to climb the path between temple 46 and 44/45 at winter. Only in the last 5 years 10 people had died. We suddenly realized how incredibly lucky we were to have found this guy and how incredibly careless in not even brining a sleeping bag. When the fire would catch the big logs and cover our frozen limbs with paradisaical warmth, Yamaguchi continued: This Buddha therefore took the hardship in building up this house and making it open to all pilgrims coming by, even providing logs outside, for a quick fire and now and then refilling the wood stack. Inside the house was decorated by pictures he drew himself as well as from other visitors, who left them behind. We also had a kettle to warm water up and some more kitchen utensils to prepare a dinner, while we spread out what we had left in our bags, Yamaguchi had bought/goten some vegetables from farmers living on the way up and cut them in pieces. Then he threw them into a larger pot and prepared the best stew we had ever eaten, having had no real meal for a while. We were in the mid ages, enjoying a good hot stew of, "what was left" in front of a black looming oven warming us up in the middle of the icy mountain dessert. And then everybody packed out stories from his life, while we warmed each other with hot mountain tea and hot sake, he had brought in a marmalade glass. Yamaguchi was an amazing person and even amazed us more, when he showed us pictures he had drewn on his journeys. Apart from being really great they were really abstract and full of interesting but easy to catch symbolism. Alas he had not the confidence in trying to going public with them. We would fight ourselves a long the road we have seen outside to temple 44, and from there on again over and through mountain forests to temple 45. From there we would as a first plan watch over the parking lot for cars having a the number plate of 高知県 and in success find the corresponding people and asking them for a lift. If this optimistic plan would fail, we would have again to fight ourselves to the legendary route 33, the only road leading through the tightest mountains in the center of Shikoku breaking from Ehime prefecture through on the other side of the island through Kouchi. There we would try our luck with hitchhiking a car heading to Kouchi prefecture. Crossing the border we should try reaching temple 35 清滝寺　Kiyotakiji, which according to Yamaguchi, allows food traveling 遍路 Henro to rest for free, yet does not provide Futon or blankets, only 畳 Tatami mats. Try to find Route 33 crossing Shikoku's mountain heart. After reaching out last temple 45, our plan was to go for this road and use it for orientation to reach Kouchi. The Buddha, who created this paradise, also provided us with 布団 and pillows and blankets to sleep on really well and warm, even when then heat of the oven slowly vanished. So we were able to sleep for almost 12 hours and catch up on the missed sleep at the お風呂 the day before. When my companion Hung Lun and I woke up we decided to thank Yamaguchi by giving him money, since he is lacking it very much. However I have learned by know how hard and even disgraceful it is to accept money from others. So we extended the idea in buying two of his art pieces from him for a fair price of 10.000 Yen (60 Euro). he reluctantly accepted, even though he didn't want to take money and give the pictures to us for free. Then I made him close his eyes and we put the money in his jacket's pocket, close the lid and told him only to open it, after we left the house. I further asked him for a contact address, but alas he had no email address and being homeless also no other form of contact, so I at least gave him mine. We also took the contact address of the Buddha intending to send something useful to him, to use for this wonderful house. Then we left the house and followed the small road outside southeastwards. It soon lead us to another hut of a very old hermit processing wood out in the open under ice and snow. We decided to visit him and asked him, whether we could have a look at his wood. He gladly accepted our inquiry and showed us two rooms with carefully wonderful processed wooden pieces of art. He didn't speak much, but nodded at the question, whether he would live all by himself up here. When we left he made us accept to mikan as a o-settai. We continued walking on the road, which after some hours lead to a bigger road and a more populated area. There we made a stop at a cafe and had our breakfast. A family on a family trip was also just holding at the same place and marveled about our plans. The nice lady of the cafe gave us two bags when we left and wished us the best of luck in reaching Kouchi. When we followed the road further the two cars of the family passed us bumping and waving heavily wishing us all the best (Ganbatte!). After some more hours, we found the first real bigger village after a long time, which even had a real Konbini. I think I was never more happy seeing a simple thing like a Konbini. We filled our supplies extensively used the Konbinis toilet and I was laughed at by kids, who probably had never seen a foreigner before. Also people would steadily complain, that I would occupy the bathroom too long. So in the end it was a quite disturbing feeling, and I quickly wanted to get away from this place, so we head onwards. After one or two more hours we were closing in temple 44, but found a art museum on the way and made on more stop there. The pictures were all drawn by artists from this island and some were really impressive. Having been to a couple of art museums in the last years, for the first time I would understand when artists here would pick up on Picasso or other famous European artists. I even recognized Dali's abstract figure art in paintings of one of the artists and was quite surprised. The interesting part was they they would combine ideas from the artist with Japanese ideas of art, which lead to really interesting outcomes. At the counter you could buy postcards of the pictures for as less as 50 yen (30 cent), so I bought a lot. Also since Yamaguchi told us that he was from Matsuyama, we had the idea of donating his pictures to the museum. The receptionist was quite surprised but accepted after calling the manager down to the reception. We provided them with all we knew about Yamaguchi, but alas of course couldn't give them any contact address. I really hope that he will contact me some day, so I can forward his address to the museum. This is when we slowly felt like real 遍路 Henro, only after making this decision naturally. We walked on through some wooden streets to another quite desolate village, where after a lot of searching we found temple 44 大宝寺 Daihouji, which is only accessible by a long stairway leading on top of a plateau within a forest. After the great port, a story related how the temple burned down and was rebuilt after only the guardian god statues remained. The temple is a true pear in the midst of forest trees and looks like a well hid secret. A place for elves to live at. We payed the temple our respect and got a signature, made some pause and then without leaving the forest, followed forest paths to our last temple in 愛媛県 Ehime prefecture: No. 45 岩屋寺 Iwayaji. Again we left civilization and walked between wonderful forests on small paths, sometimes leading over hills, and sometimes making us mountain climb again, being really happy when it went down again. However ice and snow made the small paths leading down very dangerous. In the middle of a forest we found another hermit, who built a really interesting snowman in front of his home and had a wooden statue with hat on which a poem was written. The person however was not at home and we went on. When we hoped to finally reach the temple the path lead up a mountain again, and when we began climbing down the mountain, light was already fading away. Studying our maps more thoroughly we suddenly realized that the temple actually was inside the forest halfway up on the mountain. On the way from top to halfway, we saw a lot of very interesting littles statues of Buddha, but also of protection gods, as well as even a complete Minitemple, with water purifier a gate and a shrine. In the middle of the forest on a hill. But it looked all abandoned and desolate. We really felt like in a novel now. We followed the myriads of flags guiding us on strange paths up and down across countless stone faces watching our every step. When the sun light almost ceased this gave a really intensive atmosphere. Eventually we would see glimpses of the temple further down. We did not leave the forest and was still on the mountain, when we reached the temple. It was really beautiful, worth climbing half a mountain to reach it. Countless stairs and paths would lead to all parts of the temple, and after ringing a bell at the signature place, the head priest would after a while suddenly turn up behind a curtain and gladly give me the signature warning us from the cold night. A warning that would turn our bitterly true. Apart from these mystical happening we further noticed that the guardian gods next to the main gate were missing. We never saw them missing before. The whole temple had a very strange magical atmosphere to it and therefore without paying the temple respect by following the rituals explained earlier we left it. But leaving it was not easy, since we were still half way up a mountain, so it took us another 20 minutes passing countless flags and stairs and paths down until we finally escaped the temple's reaches and headed for the street. The first thing we tried was taking a bus, yet it was already completely dark and the only bus we could find, was heading to a wrong direction. We already tried heading the way back to a 旅館 Ryokan, which we found in our map books, while trying the hitchhike thumb just in case. But the first two cars we tried it on already stopped! The first heading to a wrong direction apologized while the second one, though living right around the corner agreed to bring us as far as road 33. Our benefactor introduced himself as assistant English teacher at a nearby village school. He wished us the best of luck and only reluctantly accepted one of our mikan as a gift. So there we stood facing the road of legends. Going straight for several hundred kilometers this road cuts like a knife through Shikoku's mountain heart and we should use this knife to cut our way through to the other sides of the mountains: Kouchi Prefecture. When considering a good spot for another hitch attempt, we noticed a bus stop. We read through it and it announced one more bus would be driving in our desired direction, expect for holidays and the 正月 week. Darn! But looking closer and asking a lady repairing her car on the other side of the street, we found a little line saying 正月 except Friday. Today was Friday! Yatta! Yet 19:25, the destined time, passed and after it still had not appeared at 19:45 I was ready to give up, when Hung Lun asked me to wait for another 5 minutes. And indeed suddenly we saw light approach from far away and there it stand, opening the doors for us to enter. After a whole day out in the open, even the small weak heater of a bus, can really warm you up. When we were already planning where to get off, to best reach temple No. 35, the bus driver suddenly announced 終点 Shuuten End Point and politely asked us to leave the bus. We were still on road 33 and the direction we headed was correct, but we were still between the maps we carried (which ended some point below temple No. 45 and only continued some point above No. 35). So we had not the slightest idea, were we were or how much farer it would be. In this confusion we sat down in the bus stop and ate the food left to us. Then we reentered the road of legends and tried to hitch again. 1...2...3...4...5...6...7...8...9...10 no one stopped. Let's try without Henro Clothes, they might scare people at night 1st after changing cloths...2nd...3rd...4th...5th...6st...7th...8th...9th...10th. Damn maybe at another spot? And we walked on using the flashlight hoping it would protect us from cars driving over us. Still it was really dangerous, since there was no spot for walking on the left side. (Cars drive left in Japan). Trying at another spot the 3rd car stopped and let us in. "Are you crazy?" Walking on a street in the middle of the night? Kouchi Prefecture? Wow, ok I bring you across the border to a good spot were more cars then here will pass, but still you should not continue walking on the street! ", and he brought us many many kilometers closer to the border, and even across the border. We reached Kouchi Prefecture! Yoshi! Yatta! He said us farewell and gave us his neon yellow working vest, in case we would consider more street walking. He was a simple construction site worker. The lowest job you can get in Japan, and yet he drove us all the way here and gave us his trust. Then he turned his car and drove back. We were in Kouchi Prefecture, this filled our hearts. 1...2...10...20 Maybe the flashlight is scaring people? Let's try without. "Ok maybe we walk some more and try somewhere else?" And we walked and walked and walked. And we realized it was way past midnight and cars got really sparse. "Who would tale two strangely clothed men in the middle of nowhere between mountains in his car?" "Who would stop on a street like this risiking another car will hit him from behind?" And then we gave up. Just when we gave up, we found a bus hut. We walked to it, since it would at least provide shelter from three sides. When we reached it, we were really amazed. It had some nice curtains pillows and small blanked inside. On the wall was a belt from 沖縄 Okinawa with three pockets containing useful stuff like a box with pins. We soon called this place our new home and started moving in. This means we used one of our blue tarpaulins and the pins to isolate the open wall, then stuffed our rain gear in open holes at the top. We used another pin to attach our torch to the ceiling giving us a real room light. Then we prepared two comfy seats with the pillows and used the small blanket to over our upper legs. We used our bags to separate feet from cold floor and the other tarpaulin as a blanket. We further used all our supply in 懐炉 (pokcet heater), with Hung Lun having bought special heater for socks/shoes. Like this we tried to sleep. At times we embraced each other and sat very close to each other forgetting about stupid feelings of embarrassment, just trying to keep us warm and to make it through the night. What miraculously also gave us a lot of warmth were thoughts about our rooms in the Youth Heim, our beds, turning up our heater to 30 degrees enjoying some delicious meals while watching Anime. All these thoughts somehow partly manifested and our hands and feet became warmer. This always worked for about one hour, then the both of us awoke because the coldness started to hurt our limbs and body. So we stood up, picked up the torch and explored the area for a bit. We found a path next to the road leading up to somewhere and used it for running up and down. After we got warm, we went back inside and tried to sleep again. After maybe another 40 min, we were cold again, and the coldness went into pain. Slowly we would design a (true) warm up practice at least every other hour by running, jumping, sit ups, push ups and the golden bridge from Chinese Kung Fu. Like this we somehow spent/survived the night having minus temperatures for maybe around - 5 degrees (the next day was -2 degrees, but then the sun had already warmed up the air, in the night it must have been even colder). "Bus does not operate on Saturdays and Sundays". Shees! Shou ga nai (there's nothing to do about it), so we packed anyway and moved on on the street. So on we went for some more kilometer / hours a long the 33. When finally we saw a bigger settlement in a valley between the mountains. We already could see a Konbini or supermarket in our minds and increased our pace. And indeed when we had half past the village and already given up on the idea of a market, there it was. Right side of the street advertising some goods on the street. "ahhh", we sighed, went inside, and had some little breakfast as well as a fill up on our supplies. With anxiousness we looked ahead on the long an never ending road 33, that would continue for many many more kilometers. The next town with access to the rails was still over 20 km away, we were loosing hope a little bit. At this point we had given up on hitch hiking, after trying it again for a while this morning. But it would turn out to be a golden dawn. Just when we finished and ready to go, a man from the other side of the street spotted us and invited us to a hot cup of coffee. I was quick to decline, since we wanted to reach this rail access town 佐川 Sakawa as quickly as possible and find a way to 高知 Kouchi, the prefecture's capital. But somehow he must have overheard my protest or taken it as a polite decline, since he offered the hot coffee inside his warm house again. I looked at Hung Lun and he nodded. We could use some more warm up, so we thankfully accepted and walked with him to the other side of the street. While his wife would prepare the coffee, he would ask us about the pilgrimage and our plans. We were honest to the point, and told him that we are now just trying to get home. "The pilgrimage on foot is a perilous one", he said. "My mother has done it many many times, let me just call her". And then his mother came, a noble presence despite her 77 years and some health problems. She had finished the pilgrimage for more than 40 times and showed us her 納経帳 Noukyoucho as proof. She maybe had more than ten, and the pages of some were so full of signatures and stamps that the page's white color turned orange and you could not make out stamps anymore. She related that she started doing the pilgrimage for other people, like her son, who could not do it themselves, because of work or health problems. She would dedicate a 納経帳 to them and gather the monks blessings for them as well as pray for them in all of the 88 temples. She continued with telling us some fascinating stories, about persons who had done this pilgrimage finding new hope at the border of giving life up or finding new goals in life dedicating oneself to the sake of others. The son continued in asking in how we are planning to get back. We told him that we had to be back for work for next week and were trying to hitchhike to the next station. He gleamed and told us he had to go to 高知 Kouchi on business matters and would gladly take us as a final o-settai. I wanted to give something back and thought of all the cards I had bought from the art museum close to temple 44　大宝寺 Daihouji. Himself being rooted in Shikoku, I related that all artists of this museum are from Shikoku and that I would be so glad, if he could at least accept those cards as a little thank you (as they were all we had left). He said he understands that they are probably important to us, but eventually accepted then. We said farewell to the family and bowed deep before the mother, which in our eyes had already become a Buddha. We climbed his cars, he put our begs and staffs on the front seat and didn't mind anything getting dirty. And then we drove for something in between 1 and 2 hours together. We would talk about many things. He was interested in our home countries Singapore and Germany, but would also tell us a lot we didn't know about Japan and Shikoku. For example, Shikoku's population is dwindling and becoming less and less every year. All the young ambitious people feel the pressure of Japanese society of becoming rich and making career and leave Shikoku for the countless surrounding big capital cities. On another part he told us that the people undergoing the pilgrimage would become more and more every year and currently reaching numbers between 200.000 and 400.000 a year. Thus the time flew by and when we reached the station in 高知 we felt fully recharged thanked the man by all our heart and said farewell! We entered the station and this time made the officials give us a detailed list of were and when to board a train, where to change to were and how we would come home. The list became a little bit mysterious at the end speaking of ムーンライトながら (= under/during moonlight). With the 10.000 Yen bill we were able to afford another 青春１８切符 Seishun 18 Ticket and when we saw the first time displayed on our written schedule (they can not make printouts and always write it by hand), we boarded the train and fell asleep immediately. "終点須崎、須崎です。降りてください。 Final station Susaki, please get off the train." "Sumimasen, how can we get to our next schedules station? This one is not on our list!" He looked at us and replied, that we had gone into the wrong direction. We asked the station official for advice, but eventually came up with a plan ourselves. The problem was that our schedule to reach 厚木 Atsugi was quite fragile and we could not afford a 1-2 hours delay. So our idea was to take and pay for Rapid Express trains until we would catch up with our Kippu plan. The official calculated in his head and said, we should take the Express until 琴平 Kotohira, then we would be able to catch up. "5.000 Yen each please! ", he replied. Shou ga nai! We payed and were able to catch up with our schedule in 琴平, as promised. This time we continued northwards and crossed the second bridge leading to 四国 Shikoku, the 岡山橋 Okayama bridge. It was quite beautiful, the sun was at its peak and we saw the glittering ocean below the rails and wonderful tiny islands, sometimes with no more than one house on them, all along both sides. We saw ships sailing in the wind and people walking out of their houses on the islands. After reaching 岡山 Okayama we followed the schedule and once more switched trains along the 東海道 Toukaidou line. The historical railways connecting east and west Japan. We had a lot of time. I finished reading the book, which I started on the first day, a biography of Nelson Mandela and Hung Lun sleeped a lot on my shoulder. But the journey had no end. Because of another mistake in 岡山 we fell behind our schedule for another 30 min. but we soon realized that the whole schedule was very strange and we would still be several hundred kilometers away from home, when the trains would stop at midnight. Anyways we tried to get as far as possible thinking over the past days, thinking about future days, resting, talking, rethinking the schedule, fearing of we could survive yet another night out in the cold cold open. Around midnight we stopped in a city called 豊橋 Toyohashi, somewhere between 名古屋 Nagoya and 静岡 Shizuoka in 愛知県 Aichi Prefecture. And then there were no more trains scheduled on the electric display board and we were stuck. We first went to the toilet brushed our teeth and were ready to leave the station and search for a cheap hotel, having open still after midnight in a small town like this, when suddenly a train appeared on the electric display board: Moonlight Nagara (under/during Moonlight). This mystic train was apparently bound for 東京 Tokyo and on it's route it would stop at major towns. Under those towns was 小田原 Odawara, the next biggest city close to 厚木. The train was schedules for 0:45 min. I asked the train official about this train and he confirmed we could board it with our 青春１８切符 and would only need to pay another 500Yen when asked inside the train. I further inquired that it would reach 小田原 at 3:55 am. Finally I asked him about the first train from 小田原 to 厚木, but since this line is hosted by another railways company he could give me no information about that. For a while we still glared amazed at the electric display, were this train had appeared. Then we waited for them time to pass. Hung Lun reloaded a little bit of his cell phone batteries with a power plug we had found at the toilet and wrote an email to his girlfriend in Germany, that she needs not to worry. I walked around the station had two more hot drinks from vending machines and browsed through magazines. Then the time came and with it the train. All the seats were booked out so we had to stand. Since only the seats were heated, standing was very cold and yet again we got throughly frozen. But the train continued station to station, each station at least 30 min and at most 50 min away, only stopping in major towns. The train official passed by us but did not ask for tickets, so we did not have to pay the 500 Yen. We tried to sleep, but it was too cold. We were not the only ones standing and it was interesting to observe the habits of the other Moonlight Riders. Some would eagerly watch for the train official then quickly sit down at a vacant seat and be angrily pushed away when the seats owner came to claim it. Some would rush out of the train at stations, buy a hot drink from the vending machines and rush back in. One girl would build herself a blanket camp behind the last seats in a row, almost completely vanishing behind the seats in this tiny corner covered by her blankets. Another guy would together with me also claim a vacant seat close to the space in between wagons, warm ourselves a bit up and quickly stand up when the official came. We smiled at each other, without exchanging a single word. Hung Lun on the other hand, would claim a broader space behind a last seat row and simply stand there, getting a bit of the seat's warmth and try to sleep. At 3:55 we arrived in 小田原 Odawara and left the train. We were anxious to pass the 改札口 kaisatsuguchi, where you had to show your tickets, since it was already Sunday by now and our 18kippu was stamped for Saturday and expired 4 hours ago. Yet the 改札口 was un-maned and all gates were open to pass. So we passed and sighed. The 小田急線 Odakyuu Line, which would bring us home was still closed, but in opposite to its closed entrance was a little Konbini, where we inquired the opening time. "4:30 am" the man behind the counter replied quivering. He trembled, because 小田原駅 Odawara Station was just as cold as it has been outside at night on Route 33. Yet lacking a night of sleep it felt a lot colder. So we bought some microwave food, let the clerk warm it up for us and warm ourselves by eating. Surprisingly there was not warm drink vending machines, and the warm drinks from the Konbini were all cold. So we quivered for 30 minutes, when the 小田急線 Gate opened. I asked a female opening the ticket machines, when the first train would leave for 厚木 and she replied 4:53 am. やった！ Yatta! We would last another 20 minutes and then be able to get home! For some reason Hung Lun wanted to enter right away and I agreed. Down at the platform we found a waiting room, .. which .. was .. warm inside! Woo! We warmed us up, boarded the still cold train at 4:50 am, sat down and fell asleep. We overslept some stations, but luckily somehow noticed our stations, woke up in time and left the train. We had reached our home town 厚木. All that separated us from a hot shower and a bed was a 10 minutes bicycle ride through the cold cold night. But we did not hesitate and the thoughts of a warm shower and our beds gave us warmth and energy yet again. Our bikes were still there and we made the final last part home. We embraced each other and left for our rooms. I had a shower worth an お風呂 or 温泉 using temperature around 40 degrees, put the heater to 30 degrees and made some hot tea, while I was in the shower. Then I went to bed and slept immediately. Coming home never felt that good. But in spite of the hardships and the creeping coldness, it would never want to miss the experience of this journey. Although it lasted only for one week, I learned a lot about myself, realized many weak points, when I got (only inside) angry at Hung Lun for no reason or even my own short coming or how I would react to other people after missing a night of sleep and being totally exhausted. But I also thought a lot about my future (to save the world) and gathered a lot of plans and ideas. Also about whether and where I would maybe join a past graduate course trying to obtain a PH.D. I also thought about friends, life in general and the problems of this world. Finally I sometimes tried to overcome thinking or meditate to bear the coldness e.g. or when standing in a train. Wow, this is incredibly long. I sincerely have tried to read it (on screen), but I have failed before the third part. Perhaps you can tell the story to me when you're back? that's why I structured it in chapters like a novel, so you could read one chapter at a time ^^. However I do agree that reading long texts on computer screens is not really enjoyable. On the other hand printing everything out in paper is not very enjoyable for Mother Nature. I guess we have to wait for a paper/ink combo, where you can print many times on the same sheet of paper, without the ink containing harmful substances.